theGreatPatzer: what IS A GREAT PATZER? what IS A GREAT PATZER? “PATZER?” -an Inept Chess player. Derived from the German word, Patzen “to Bungle”. Its just as cool insult some German dude gave someone many years back that sounded cool and went ‘viral’. SO Lets face it – Chess improvement is very, very hard. So being at the very humble rating of 1187- its likely, even inevitable that I will be rather weak for a very long time. And this rather unmotivating thought is the key, no the BASIS, of my whole improvement plan. The fact is during my 40year life, I have been interested in chess- off and on- several times none of which had any tangible increase in chess strength (to say nothing of a Chess Rating), the problem not having a sustained interest In it. The only three things that work; Study, Serious games, and Time. Being a GREAT Patzer is not nearly as easy- but definitely Doable! and in recognition of this high aim; I’m embracing the nickname and entering the World Wide Net so that I’ve said it loud and clear. And what DO I intend to do? Well as of Aug 13, 2014- I was at an ELO of 1187. It was clear to me, that as I trained some things would work and others things wouldn’t. but what really wouldn’t happen- is for me to get some kind of slow assurance that yes, I am actually fractionally improving at chess. I NEED that kind of assurance. Unfortunately its not very easy to figure out how to put any kind of chess study in terms of ELO rating; Rating is a performance metric primarily and can’t be easily put in terms of tactical puzzles solved, games played, analyzed or annotated. So what I’ve done is to simply guess a relatively low increase of Rating per hour; Keeping in mind some types of chess study might yield more or less ELO. So the Guessed amount is 0.23ELO/hr with deductions for skipping nights. As you can see we’ve done good, and had a recent bump in the curve; mainly because last week as did several G15 games on the ‘net- and lost less to my deductions for skipping nights. SO. Well in advance of Retirement, If I can hold the pace- I can make expert. And that, with the relatively humble pace of 62ELO/year. But the big DEAL here is track TIME in terms I can relate too. 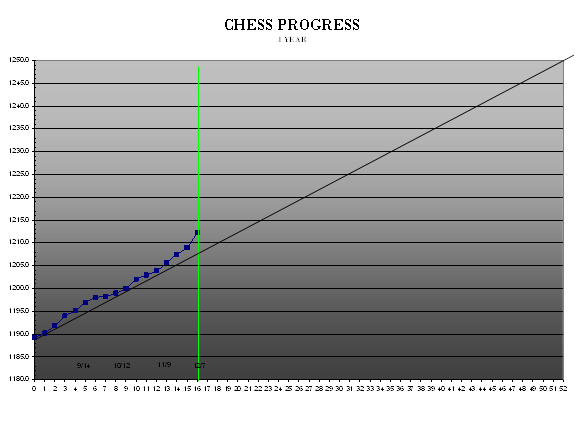 And I am sure that if I keep rotating between well known activities that tend to increase chess strength- the ELO will eventually Catch up. The GREAT and NOT-SO-POWERFUL Patzer!